A coffee farmer in Rukara, Kayonza District (file photo). The Chinese Ambassador in Rwanda, Henry Rao Hongwei, has assured Rwandan coffee and tea producers of ready market in the Asian nation. He was speaking during a visit to Rwanda Farmers Coffee Company (RFCC), a coffee roasting plant located at National Agricultural Export Development Board (NAEB) headquarters in Kigali. The visit, which followed the recent trade agreement signed between Rwanda and Alibaba Group, the Chinese e-commerce giant, aimed at having an idea of the coffee sector in Rwanda and the plan to export to Chinese market. They envoy promised to attract more investors to Rwanda by providing them with more information on available opportunities in the sector. "Rwanda is well known for its high quality coffee and tea. I do believe there will be a big market, a big potential for Rwandan coffee in china. The bilateral relationship between Rwanda and China is at the best stage currently following the mutual visits by heads of state," he said. "The top priority for Chinese Embassy in Rwanda is to transform the consensus of our two heads of state, into benefits of the people of the two states," he added. Sandrine Urujeni, the Deputy Chief Executive Officer at NAEB, said: "It is a great opportunity that Chinese embassy is promoting our roasted coffee in China. It is our vision to export coffee with value addition. We are in trial phase of working with Alibaba to export roasted coffee to China. We have many roasting companies and three of them are already in partnership with Alibaba and more might join soon." By the end of 2018, Rwanda expects to export 24,500 tonnes of coffee, from 23,000 tonnes last year. The main destinations are Switzerland, USA, Singapore, UK and Belgium, according to NAEB officials. Coffee makes 48 per cent of Rwanda's agricultural exports, according to figures. Rwanda Farmers Coffee Company (RFCC), one of the coffee roasting firms working with Alibaba, started operations in 2014 and works with 4,352 coffee farmers of which 36 are women. The plant produces 3.8 tonnes of roasted coffee per day and has annual capacity to produce 1,003 tonnes, according to Benjamin Nkurunziza, the sales manager of the factory. 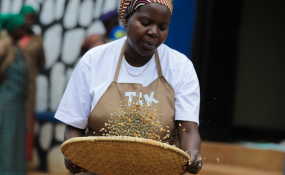 "What we produce constitutes 6 per cent of the total roasted coffee in Rwanda. We expect more exports as we have entered into a partnership with Alibaba. We recently exported 1,600 packages of Rwandan roasted coffee and next week we will again export 400 packages, which is under trial phases to gauge the market in China," he said. The export is being made through Tmall Global, the Alibaba online business platform, and Hema, an Alibaba offline platform. "We are exploring the roasted coffee market through market intelligence processes, master Electronic World Trade Platform (eWTP) Africa hub developed by Alibaba.